This "The Vortex" video asserts that Fr. James Martin being a heretic might explain the Jesuit media darling's animus against Church Militant TV as much as the cancelled public appearances. "[T]o foster a more prefect life to promote public worship or Christian doctrine or to exercise other works of the apostolate such as initiatives of evangelization, works of piety or charity and those which animate the temporal order with a Christian spirit." Moreover, Fr. Martin rails "Traditional Catholics" subverting tradition by challenging legitimate Church authorities. However, Canon 212(3) recognizes the right, and even the duty, to make their opinions on faith and morality known to their public. Michael Voris paints the internecine struggle as being heretics versus the Catholics. A more charitable viewpoint is progressive ultramontanism versus upholders of traditional Magisterium. Our Church shepherds are owed our allegiance when they preach the Gospel in accords with the Magisterium. Alas, as seen in Amoris Laetitia, progressive pastoral proposals dealing with marriage are treated as almost as Ex Cathedra announcements, even when the aforementioned Apostolic Exhortation did not align with the sensus fidae of the Extraordinary Synods on the Family. 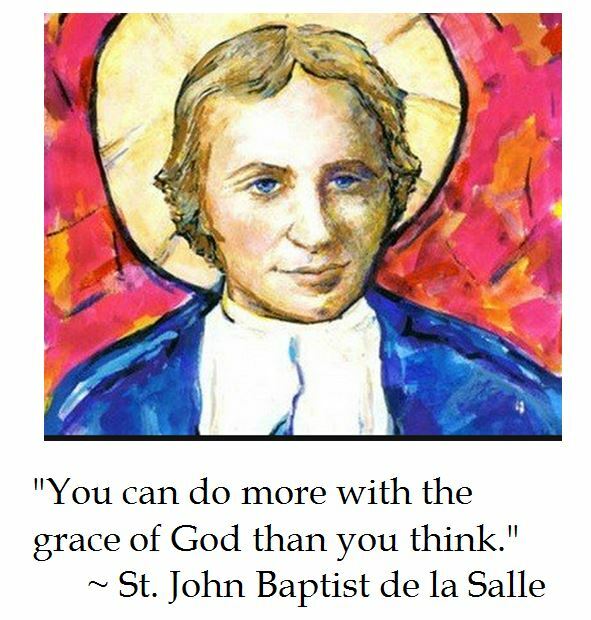 "Blessed" Alan de la Roche, O.P. (1428-1475) was a 15th Century friar who is considered to be the restorer of the Dominican Rosary. Although Alan has no official Church feast day, he is unofficially honored on September 8th, which is also the feast for the Nativity of Mary. According to Dominican tradition, St. Dominic (1170-1221) founded the Rosary in 1208 as a meditative prayer which sought to spiritually combat the Albigensian heresy (which believed that only spiritual realities were good and vehemently opposed God taking flesh in Jesus Christ). But this meditative Marian prayer featuring just the Angelic Salutation and the Evangelical Salutation fell into disuse during the 14th Century during the era of the Black Death in Europe. Blessed Alan stressed the 15 mysteries of the Dominican Rosary, rather than the alternative of 50 clauses of the Carthusian Rosary. Moreover, the 150 Hail Marys imitated the 150 psalms of the Old Testament, which harkened back to the proto-origins of the lay Marian psalter. Blessed Alan was successful at renewing popular devotion to the Rosary and reinvigorating the Confraternity of the Rosary. The Confraternity featured "after death" benefits for Rosarians. 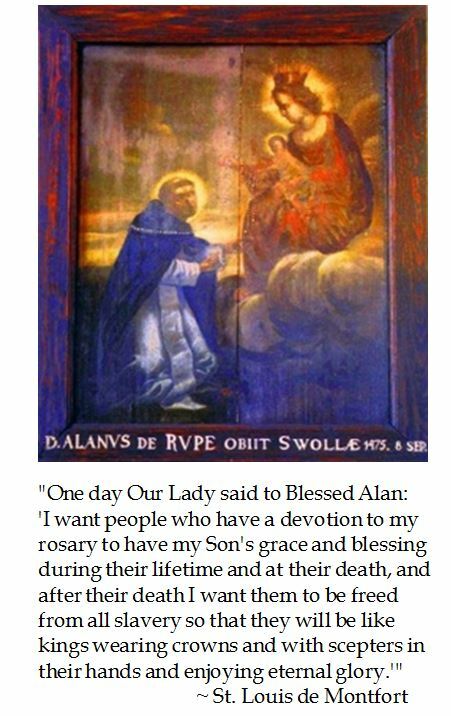 Thus Blessed Alan de la Roche may be considered one the greatest champions of the Rosary to ever live. Although Blessed Alan wrote an instructional pamphlet Book and Ordinance regarding the renewal of the Dominican Rosary, about 1/3 of the Vatican documents were lost after Napoleon sacked the Vatican archives from 1810-1813. So much of quotable material about Blessed Alan comes from St. Louis de Montfort (1673-1716) whose 18th Century works True Devotions to the Blessed Virgin and The Secret of the Rosary were buried in a field in France for over 125 years, thereby escaping the irreligious impulses of the French Revolution.